After spending a few weeks in China, I am finally free of " The Great Firewall" and able to update. China is a wonderful, surprising country, at least for a Finn like me who had never been there before. Funny enough, I couldn't help but remember Kurt Vonneguts impressions of the Chinese in his otherwise unfortunate novel Slapstick. A huge country with a huge populace, China is indeed unlike anything you would have seen before; a good time to also remember that it is already the biggest country in terms GDP. Putting aside China and moving on to Vonnegut, unlike the aforementioned Slapstick, I was very taken with Timequake. It is perhaps not as coherent as I would have liked, or as serious, but it is definitely a book with a purpose. During the years Vonnegut's voice has not so much changed but matured. The wit is still there, as is the insight but it is delivered in a more carefree way than before. As an ageing artist, he doesn't need to please anyone (not that he has ever specifically tried), and it shows. However, he also alludes to Hemingway's later years and implies that writers are not unlike the fisherman in The Old Man and the Sea; sometimes they are forced to give up on a catch (or a project). Timequake moves between autobiography and novel with surprising ease, for the most part. 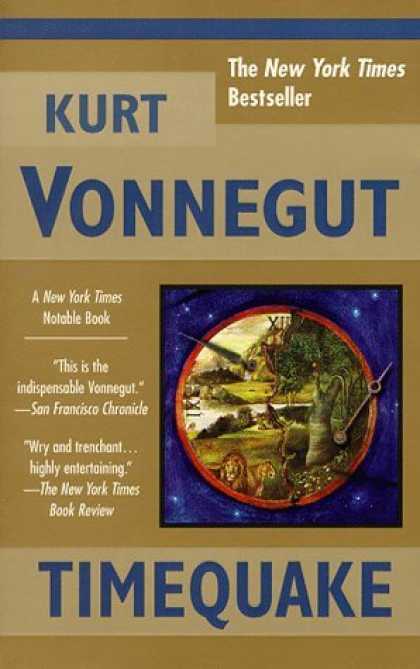 It is partly devoted to Kilgore Trout, Vonnegut's alter-ego, and partly to the great man himself. This makes for wonderful reading but also feels a bit unfinished or slapdash at times. There is no real plot to speak of but don't let that fool you. The narrative arch is well employed and overall the book doesn't feel like a minor work in the least. All in all, I was very fond of Timequake. However, it is hard to recommended it to friends, since I am quite well aware of the nature of the humour. Vonnegut has always been a cult more than a movement. The appeal may not be evident to everyone, but those who do enjoy a good farce will be extremely pleased. 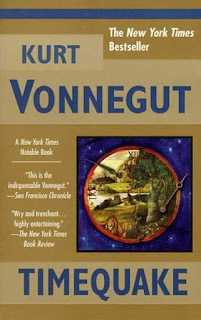 And perhaps that is the pleasure of a Vonnegut novel; it's a niche, and such a brilliant one too.